DANA POINT — Members of Boaters 4 Dana Point Harbor and the Dana Point Boaters Association carefully examined the heights and locations of the proposed boat storage “boat barn” and commercial buildings in the harbor during the weeklong period that story poles were erected here. Both organizations conducted their own research, once Orange County Dana Point Harbor officials announced that story poles would be going up Jan. 31. The story poles remained in the harbor for one week, were certified by the county’s land surveyor and were removed Feb. 7. The story poles showed the ridgelines and peaks of structures in the harbor’s Commercial Core Buildings and Dry Boat Storage Building Proposal. The proposed structures are part of the conceptual Dana Point Harbor Revitalization Plan. The story poles gave boaters and non-boaters alike an opportunity to observe how the buildings fit into the current harbor views. 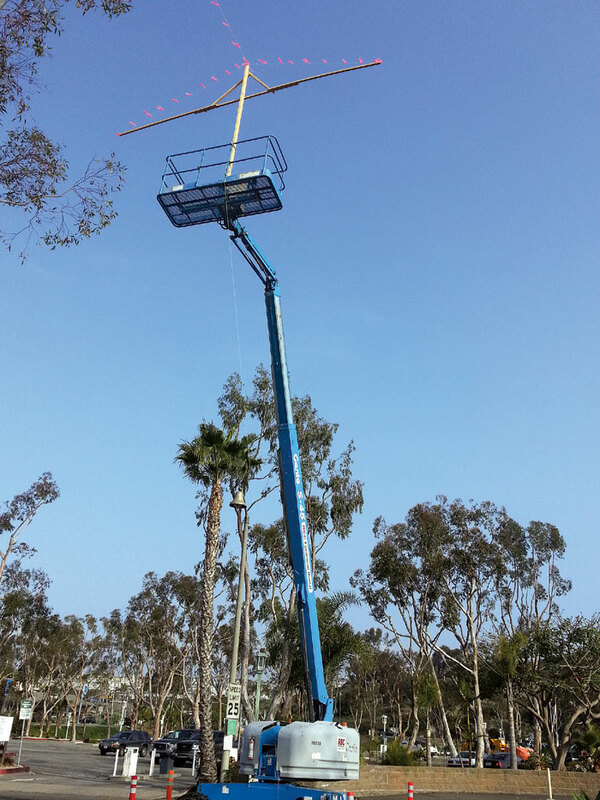 Members of the Dana Point Boaters Association said they looked at the story poles from various angles to determine how the structures would affect public views and boater resources. While the view obstruction is a concern for the association, the core boater issue is how the proposed buildings will affect boater resources, specifically parking areas. California Coastal Commission members approved the landside portion of Dana Point’s $140 million Harbor Revitalization Plan in January 2011. The first phase of the plan calls for the redevelopment of Planning Areas 1 and 2, labeled the “Commercial Core” — including Mariner’s Village, Dana Wharf, a launch ramp, a boater parking lot and a dry storage area for boats. The sizes of the proposed structures are also of concern for Boaters 4 Dana Point Harbor members. They encouraged boaters to head down to the harbor while the story poles were in place to see for themselves how the buildings would affect boater resources and views. Currently, sailboat masts can be viewed throughout the harbor — but the buildings will obstruct those views, Heyman explained. Boaters 4 Dana Point Harbor members have taken several hundred photographs of the story poles from different spots throughout the harbor. Although the poles are helpful in visualizing the placement of the structures, they do not provide a complete representation, Heyman said. Gross explained that the story poles identifying the ridgelines of the proposed building have been certified by the county surveyor to accurately depict the height as proposed. “We have our architects taking photos of the story poles for the next step, which will be to superimpose computer generated depictions of the proposed buildings in the exact locations, so we can provide an accurate image of the new and different views,” Gross said. Both boaters’ groups intend to bring their observations to a future public hearing. OC Dana Point Harbor staff members will provide specific designs of the buildings in the application for a Coastal Development Permit (CDP). The plan must be approved by the California Coastal Commission. The CDP will be finalized after the city’s Planning Commission public hearing is conducted and the appeal period expires. The application may be filed with the city of Dana Point within the next two months. Once it is filed, city officials will schedule the public hearing. At that meeting, the public will have the opportunity to voice support or concerns about the buildings in the Commercial Core. The hearing could be scheduled within six to eight months after the submittal.